“`About 200 people streamed into Elvis Presley’s Memphis after the late singer’s wife cut a ribbon and allowed fans to see the $45 million complex for the first time. An outdoor mall, the 200,000-square-foot campus sits across the street from Graceland, Presley’s longtime home-turned-museum. 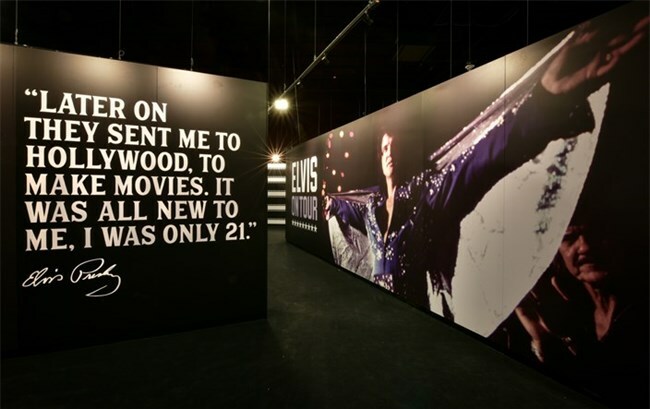 The complex features a comprehensive Presley exhibit with clothing he wore on stage and guitars he played; a showcase of the cars he owned and used; a soundstage; a theater; two restaurants, and retail stores. The opening comes before the 40th anniversary of Elvis’ death on August 16th, 1977, at age 42. “`It’s part of a $140 million expansion, which also includes a $90 million, 450-room hotel that opened last year. This complex replaces the aging buildings that have housed Presley-related exhibits for years. A strip-mall style visitor center is expected to be torn down to landscape a garden along Elvis Presley Boulevard, the street that runs in front of the house. 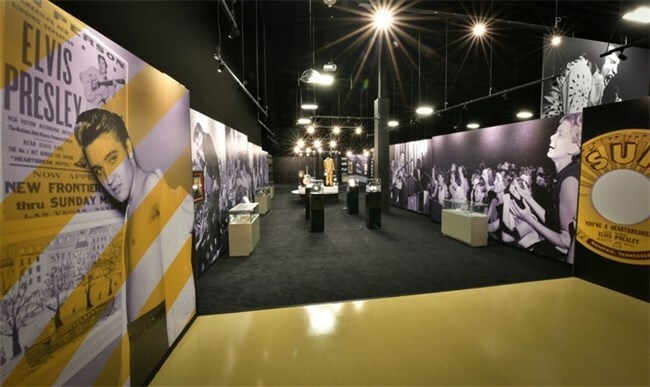 “`Graceland has been updating its tourist experience. Visitors use iPads for self-guided tours of the museum. The new Guest House at Graceland with modern amenities has replaced the crumbling Heartbreak Hotel, which is scheduled for demolition. “`Gladys’ Diner — named after the singer’s mother — has the feel of a 1950s eatery, complete with photos of Elvis and aqua-colored chairs. Folks can order hot dogs, burgers and ice cream. Across a wide walkway lies the automobile museum, filled with some of Presley’s favorite toys. Several retail stores line the complex. A barbecue joint called Vernon’s Smokehouse — named after Presley’s father — will also open. So will an exhibit about Sam Phillips, the Sun Records producer and rock ‘n’ roll pioneer who recorded Presley for the first time. “`The complex is still being finished. Priscilla Presley says there is a warehouse full of artifacts, ready for display. This weekend, the area should draw thousands of fans. This entry was posted on Friday, March 3rd, 2017 at 12:08 am	and is filed under Blog by Manny Pacheco. You can follow any comments to this post through the RSS 2.0 feed. Responses are currently closed, but you can trackback from your own site.